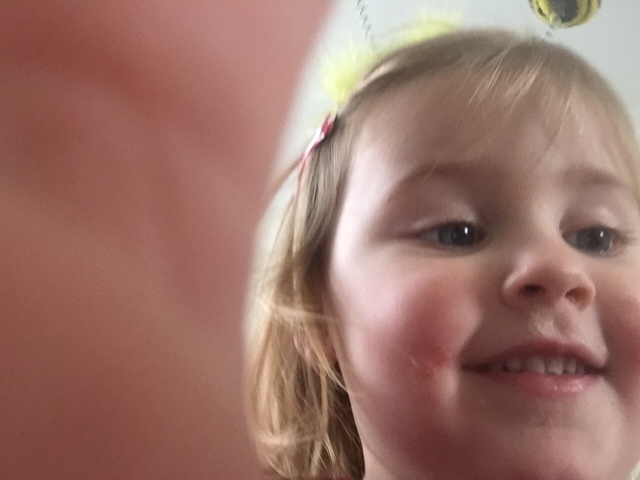 The above photo is what happens when the threenager manages to get hold of your phone, I have to say it isn't a bad attempt for her first selfie but it could do with some work, slight change of angle, perhaps the hand could do with moving over… I'm only joking. But on a serious note, at the point when this photograph was taken I was actually trying to get some nice photos of her for a blog post that I needed to get written up but she didn't want to play ball as such and really I can't blame her, the above was a much more fun alternative to what I was offering, I know I hate being made to pose for the camera. I've stepped back significantly from my blogging of late and I think my girls have enjoyed not being constantly asked to smile for the camera. That's not to say that all photographs have stopped, most of them are more of day to day life, capturing the moment shall we say. This weeks photograph kind of demonstrates that. Life gets too serious sometimes and the technology often gets in the way of what is right in front of us and this image was a way of making me see what was infront of me, telling me I need to step away from the phone and focus more on that unbelievably cute face. That is a very cute face and you also make a good point! I definitely spend less time on my phone than I used to. I try to do most of my blogging when the kids are either asleep or at school. I love this - the photo and the words. I've stepped back a bit from the blog lately too but I had to post a review of a toy the other day and had to get her to play with it specifically to get a photo - she was none too amused! I find the 3 year old selfies are the best kind! That's a lovely photo of her. Bet she was really pleased with herself too. What a lovely photo, wait until she's a tween, half the photos on my phone are of Clio.